Hello again 🙂 More stunning inspiration coming your way!!! Today I have something a little different in that it is a technique within a step by step as it were. 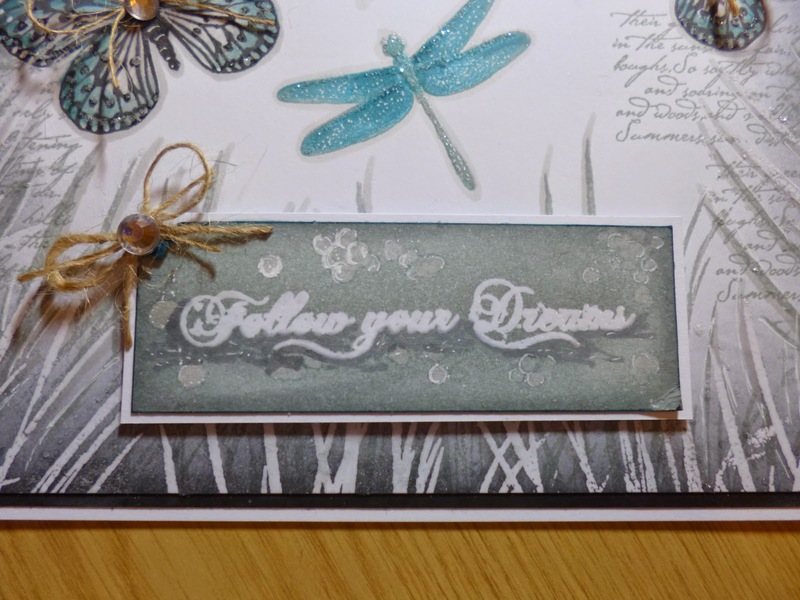 I said a long time ago I would show you how to used embossing powder to stamp into without having to get out your melt pots etc. 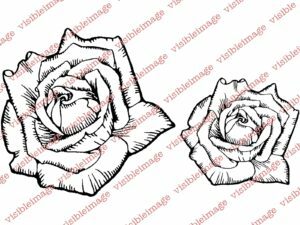 I also thought what better stamps to demo this with than my lovely friends at Visible Image‘s stamps so I chose a few to use on this card and some inks of course and got started. Here is the image for today..
Last night I had to pick my daughter up from the train station and while I was waiting it was a nice warm evening with a cool breeze coming in the window and I had the radio playing and it was old summer type feel good songs and it really helped me to choose todays images I think. 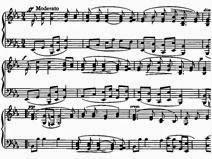 I have always loved music and been around music with people in bands my whole life , My husband was a bass guitar playing and both my kids now play and my brother is a lead guitarist so its always been in the family along with art and I was in the choir at school well into senior school from little. 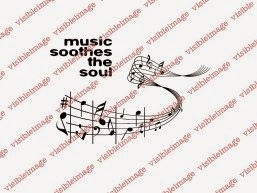 So as the sentiment says ‘ Music soothes the soul ‘ and it truly does. What music do my lovly internet friends like? comment and let me know. I started with clear embossing powder versamark ink , my Music Background stamp from Visible Image ( it’s only red cos it is stained with ink from a past tutorial haha) I took some off white card and stamped the background across the bottom third of the card one and a half times or however many fit across the bottom of your card size. 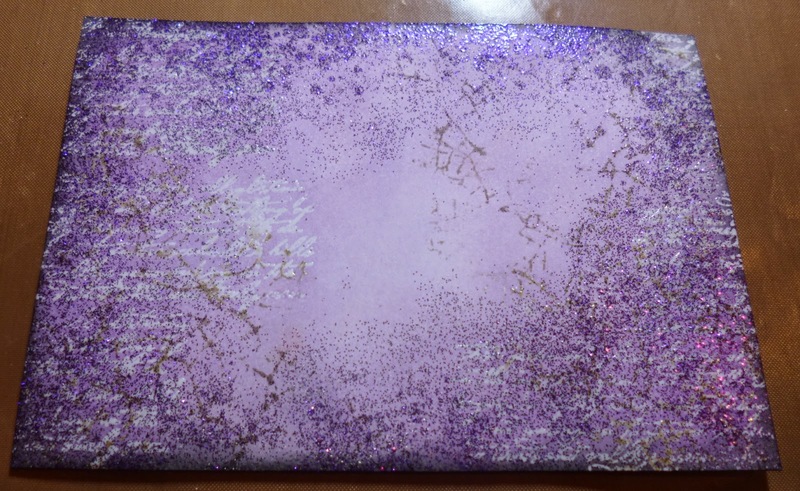 I tipped on the embossing powder and heat set of course. 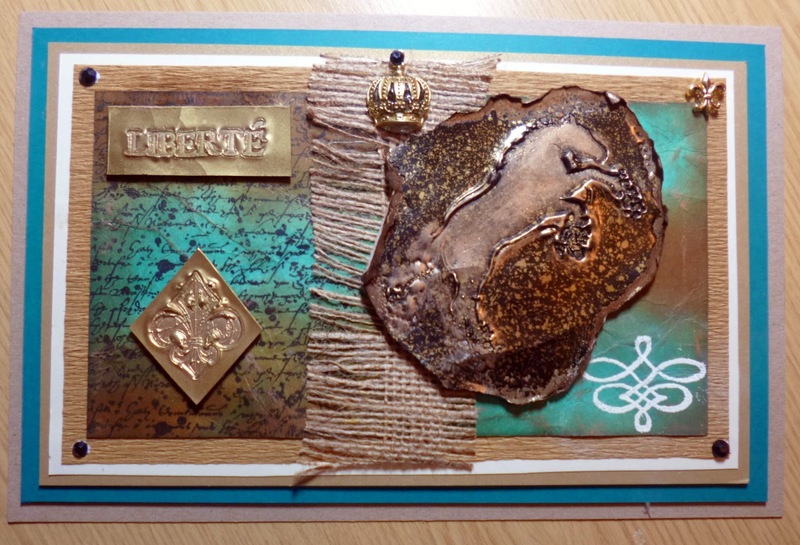 These are the colour distress inks I chose for this card, dried marigold and rusty hinge , shabby shutters and peeled paint. 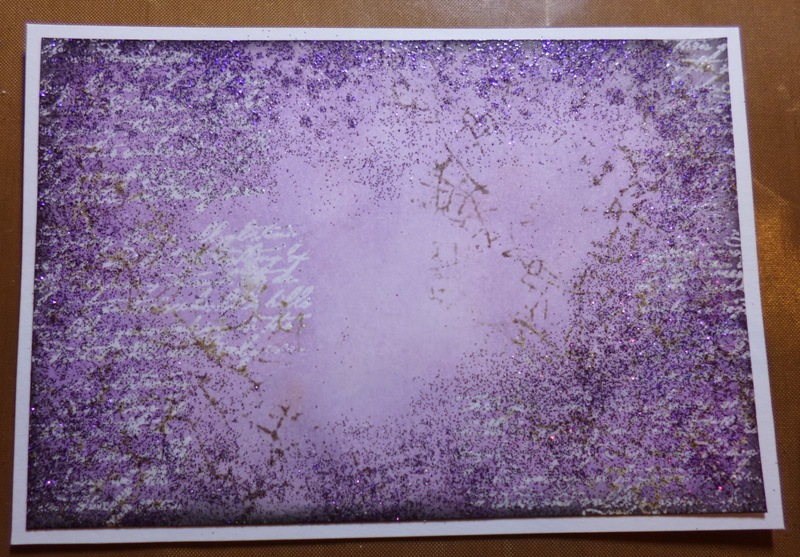 I coloured the card in the usual way with the lighter colours and then spray with water, some fine drops and some larger waited a second or two and then dabbed the water away and dried leaving the speckled backing, I then deepened the edges with the darker shades of distress and dried well. Set aside for now. 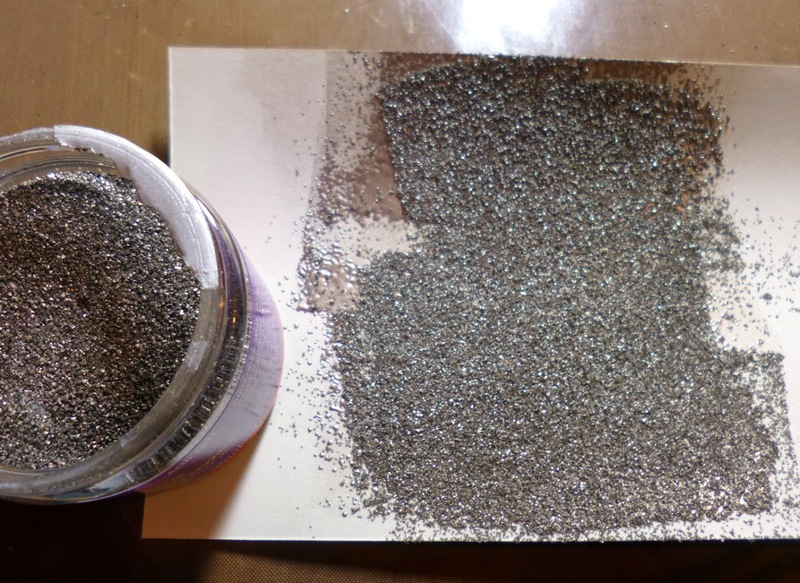 Once this layer is melted go ahead and wait a moment and then add some more versamark on top of the same piece of melted powder and tip on the next layer. Heat set again and get everything ready to heat the third layer just as we have done the first two. 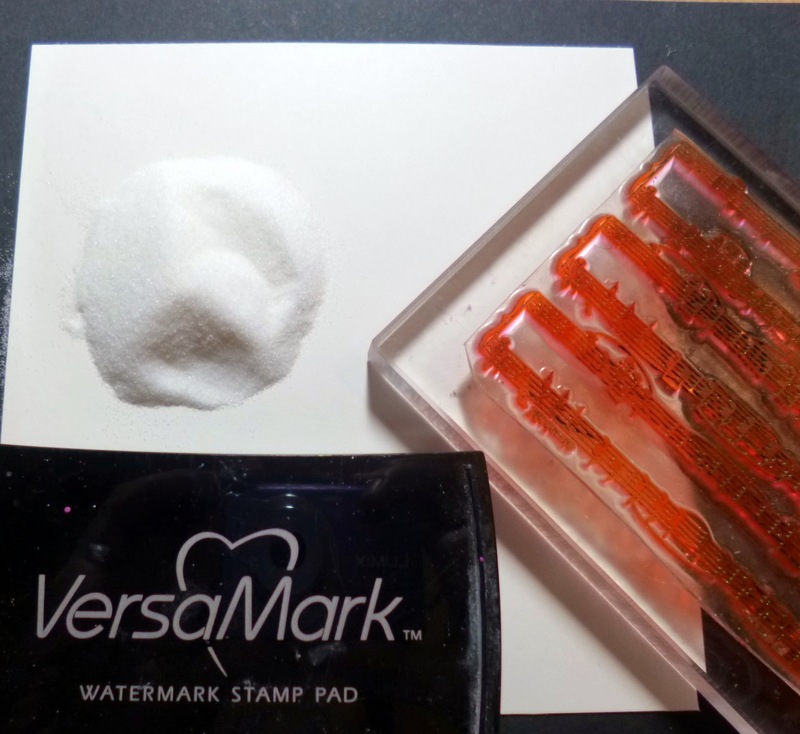 For this layer tap lots of versamark onto the stamp you are going to use as this will be needed to help the stamp release from the hot melted embossing powder. 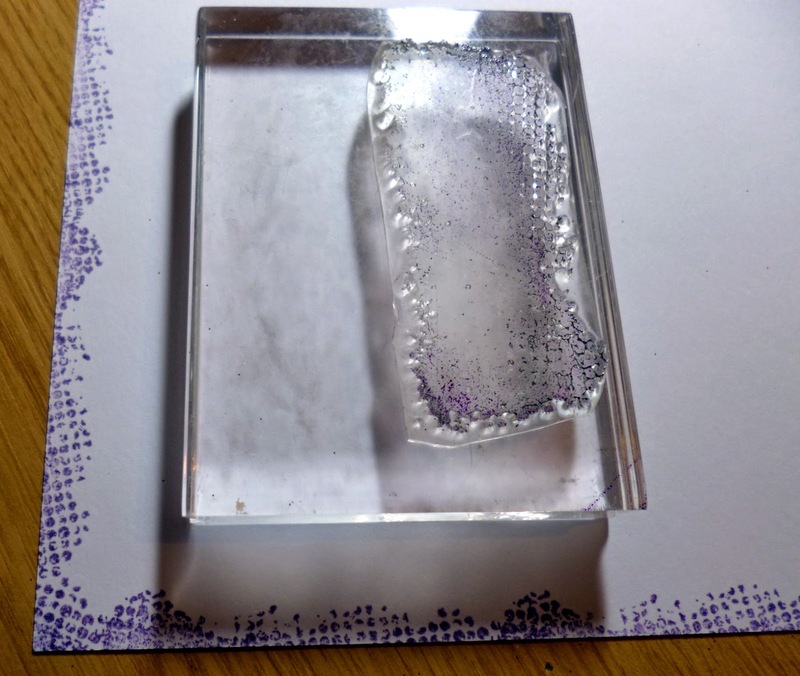 ( Please remember this will be extremely hot and will burn you if you put your finger in it once melted so do not test the embossing with your pinkies.) 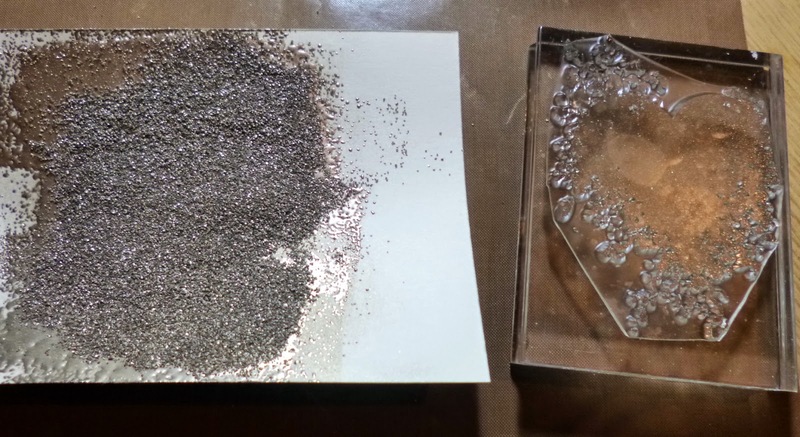 Ok go ahead and melt layer three, once it is melted lay it on your heat protection mat (not the table) and heat from directly above to rewarm from stopping to lay it down , Once you can see it molten again turn off gun and very quickly pick up your stamp and press it into the melted embossing powder, push in quite firm but be careful it can slide. 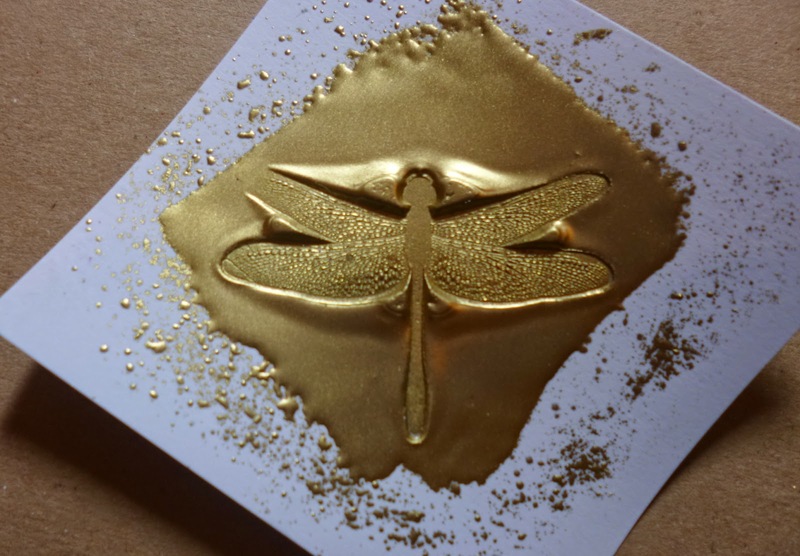 leave for just a little while, around 30 seconds or so and then lift out your stamp while peeling away the card from the underneath. 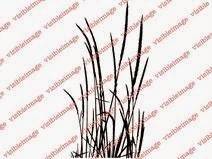 It will release very easily cos of the versamark on the stamp that was our release agent as it were. 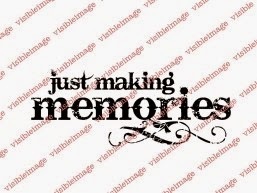 You will be left with a perfect image this is great for making signs and is how I made the bullet holes in past tutorials and signs etc. 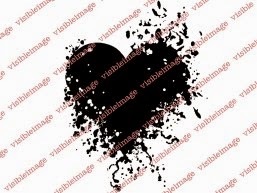 This INKognito Heart was a very large image to use but I wanted to try it as I love all the melting effect along the bottom. 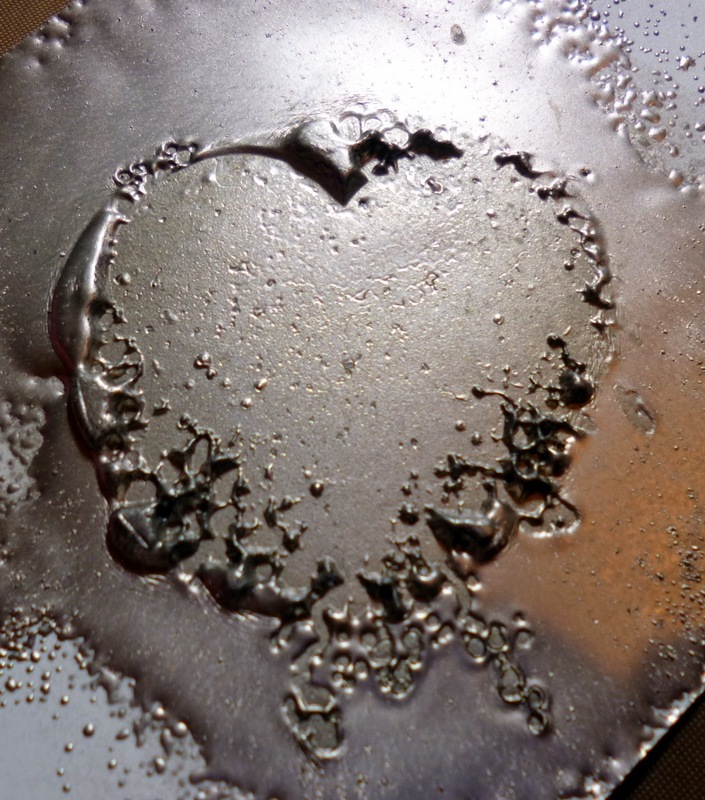 I used some black archival ink to darken the edges of the heart and some walnut stain distress and black to go over the edges I tore away from the melted heart in a very random pattern. 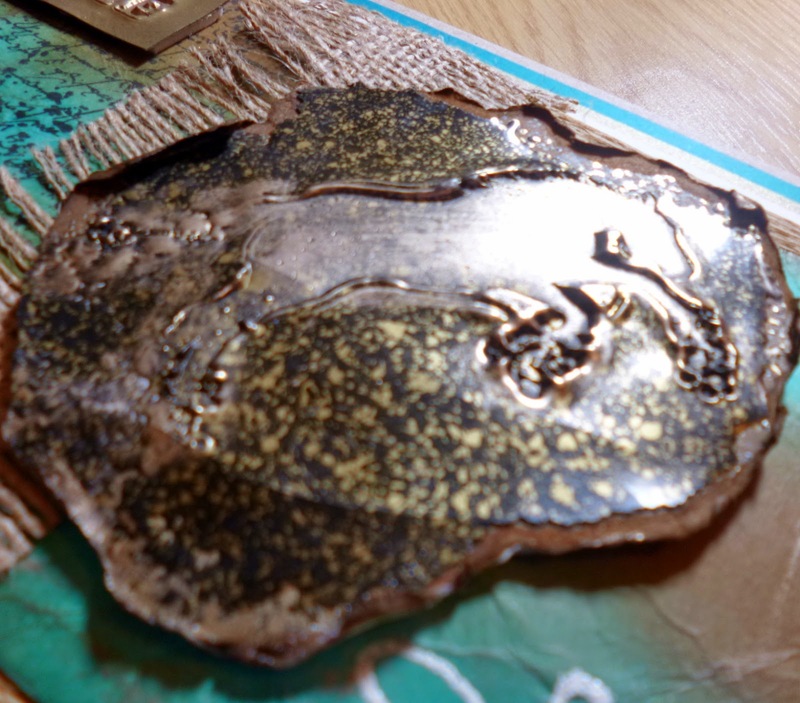 I then added some treasure gold furniture wax onto the raised edges of the heart and torn pieces too, it really brought the sunken image to life. 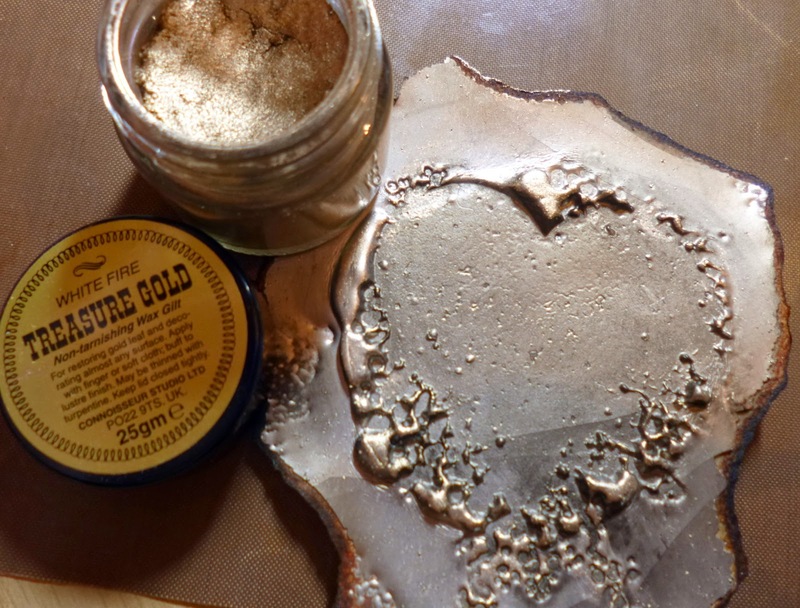 I just love this treasure gold it is so quick drying and is smooth in the pot and smells divine to me. 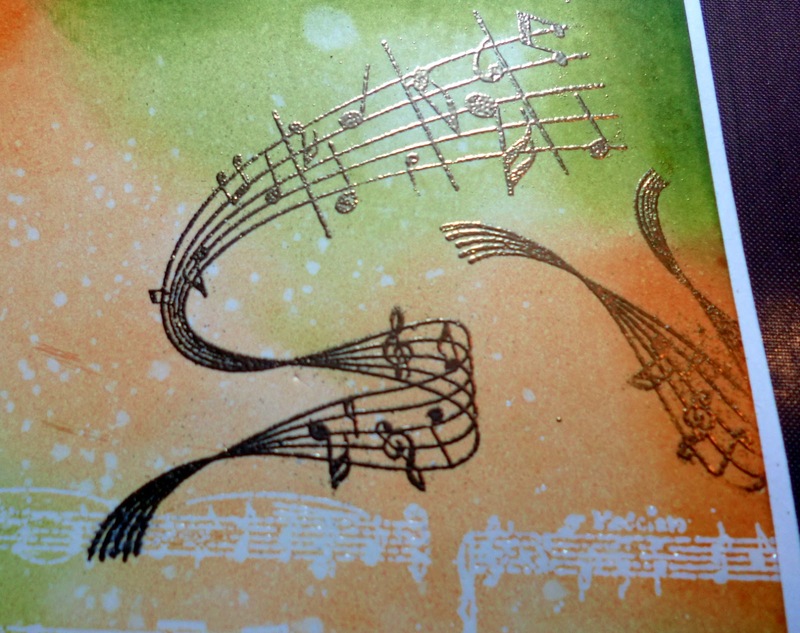 I then went back to my first piece that I had set aside and matted it onto another off white piece of card and my Image from The Soul Music set of two stamps and typed just part of the image a couple times and embossed it in normal embossing powder not utee, on the top right of the card. 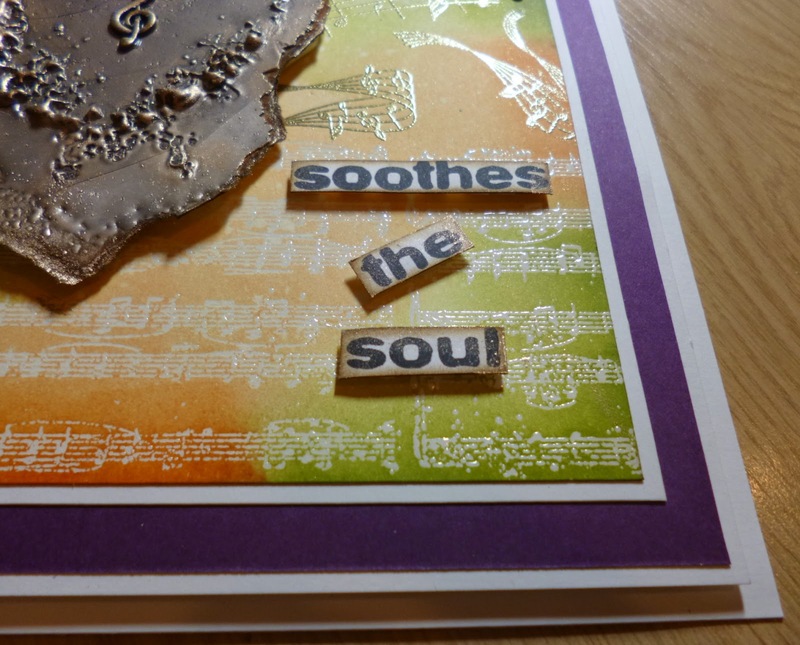 I stamped out the sentiment for the Soul Music set and cut it apart I then inked the edges in Walnut Stain, I used the small squares of foam and added them to the back of the words ready to add to card. 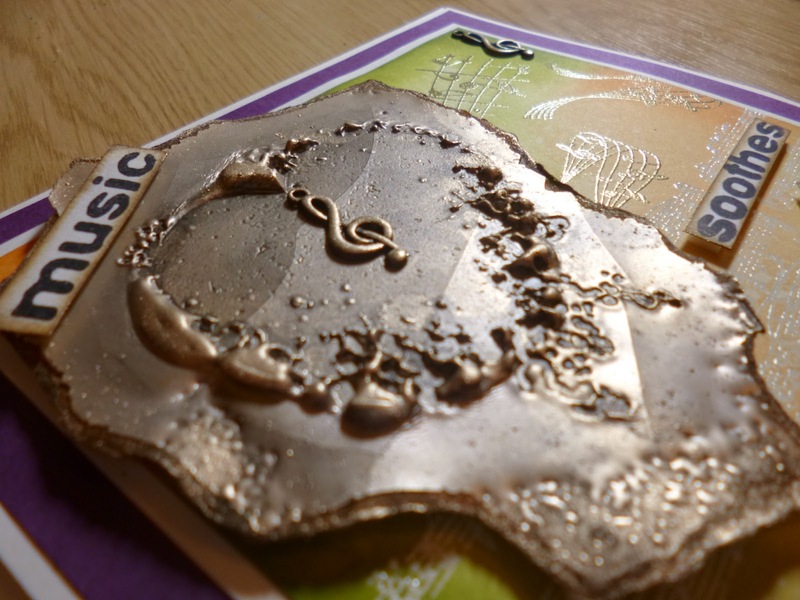 This is the bottom right of the card and you can see most of the sentiment on its foam, the Music word is above the heart. I added the music word here above the heart and a little metal charm in the form of a treble clef in the centre of the heart I also added one to the top right and bottom left of the card for finishing touchs too.I also added some more layers for a more complete look to the card, I personally think the more layers it has looks more finished and more professional looking. Here is the finished image again.. This technique always looks so impressive on a card and people always wonder how you have made it but really it is pretty simple you just have to be super careful not to burn yourself or your table etc. Here is a close up on the heart now it is insitue as it were on the finished card..
Ok so the stamp sets I used for this one from the fabulous Visible Image Duo Of Mark and Helen are..
Mark and Helen had the amazing stand, and work from us on the team on it, with them at Alexandra Palace at the weekend, did any of you manage to get ther this time? I didn’t get to go but I know they did well and were very very busy, I am so proud to be on their team and so pleased it all went well for them too. Ok folks enjoy the sunshine I certainly enjoy walking to my car after work in the sunshine for a change in the early evening, much better than the usual wind and rain. Have a wonderful day and I’ll see you next week. Thank you so much Kim for this amazing tutorial! 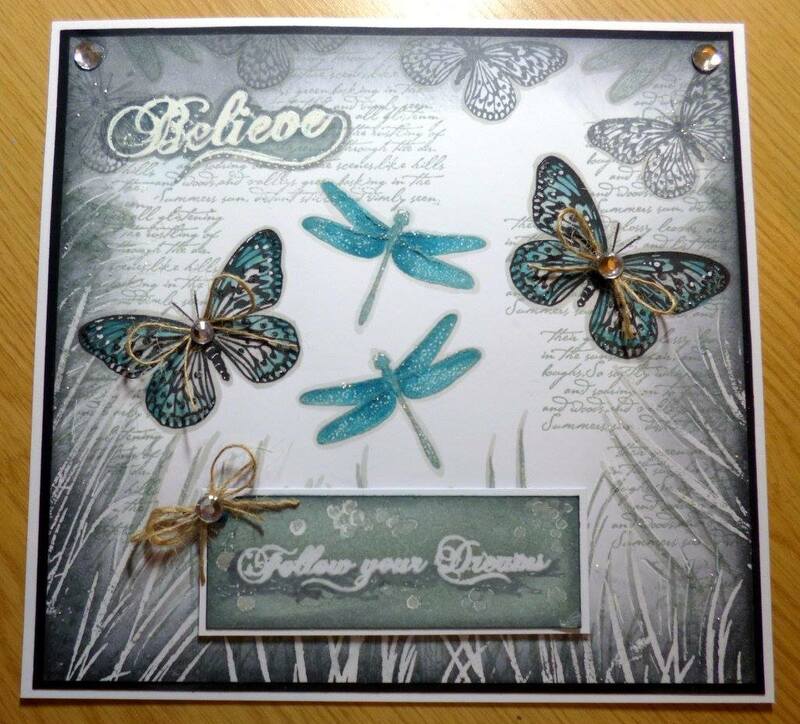 Love this technique and it shows that you can do anything with our stamps… they are so gorgeously thick! 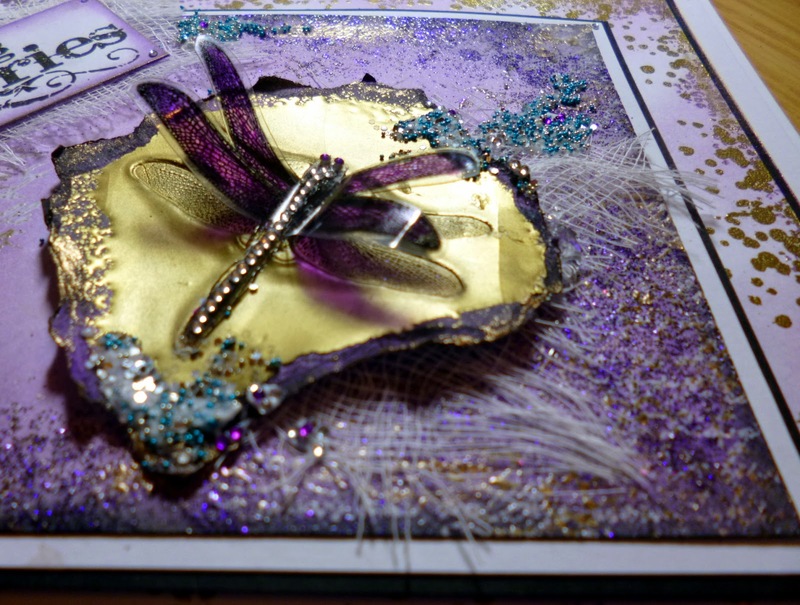 Stunning card <3 You’ll find more of Kim’s amazing work over on her blog. 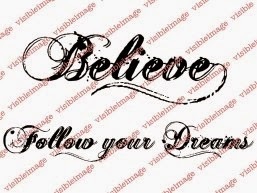 It’s Friday again, and I’m here to share another of my creations, using some fabulous Visible Image Stamps, if you’ve not tried these top quality, thick polymer stamps yet, please do, they are such unique designs, hand made and cut, and they stamp perfectly each time. Behind Every Mask, Ink Splats, the Drip and the finger print out of Drag & Drip, and the feathers and birds out of Free your Imagination. 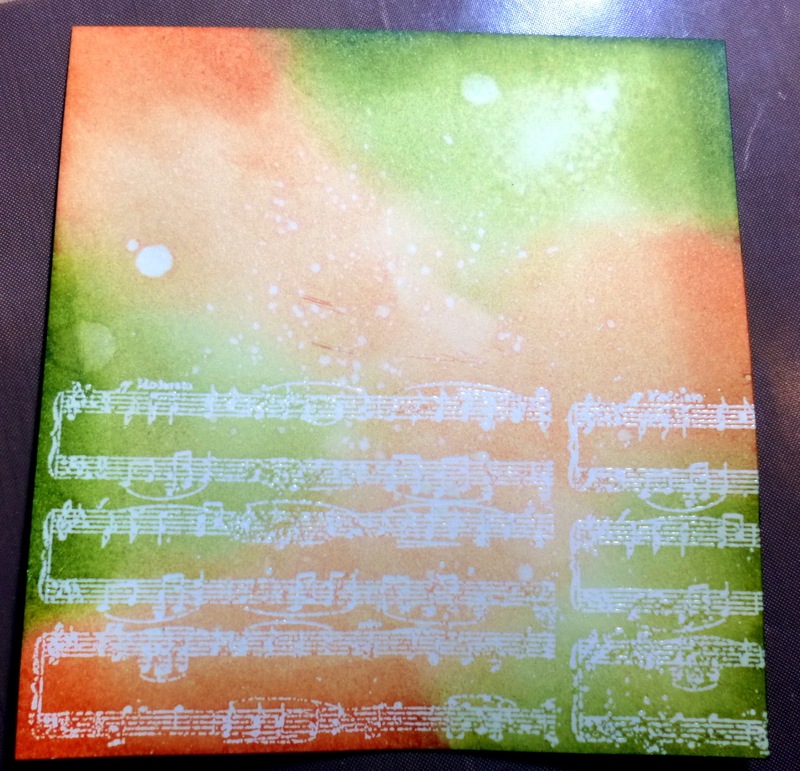 This card is 8″x 8″, and I started off with a piece of card 7″x 7″, stamping the edges with the drips and ink splats, using Oak House Studio Colour Chemistry Pigment ink pads, in 3 colours, (they are such bright yummy colours, just up my street). 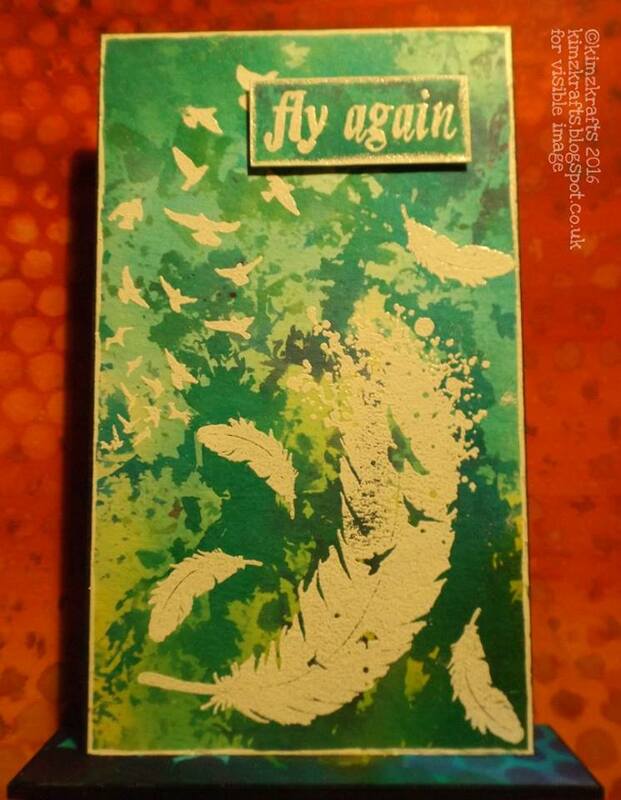 I then took another piece of card 5″x 5″, and blended the same 3 colours, then stamped the feathers with Versamark, and heat embossed using White powder, I then stamped the birds and the fingerprints on both pieces af card. 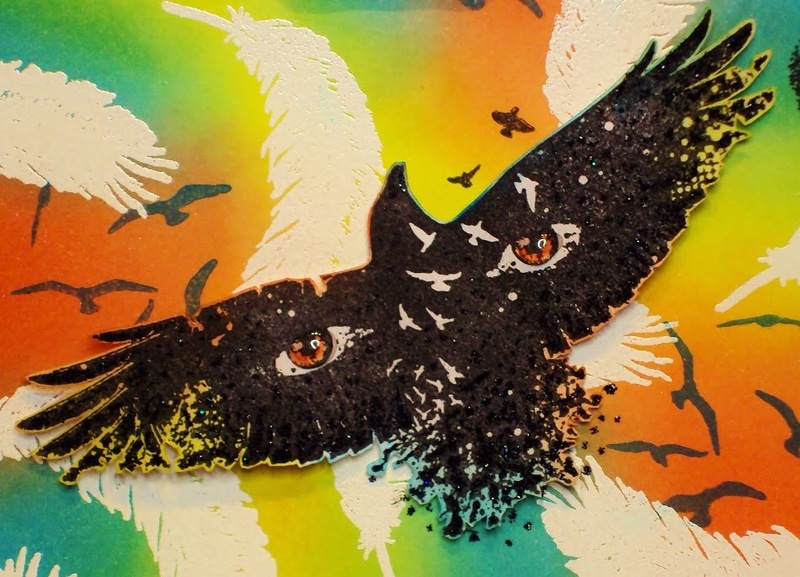 I stamped the Hawk onto a seperate piece of card and fussy cut it, leaving a very small boarder of white around it, then coloured the edges, I shaped it and attached it using glue gel to raise it. The sentiment was stamped and cut out. I added some coloured mats and layers, then put it to a black card blank added glossy accents to the eyes and Black Stickles around the edges of the Hawk. 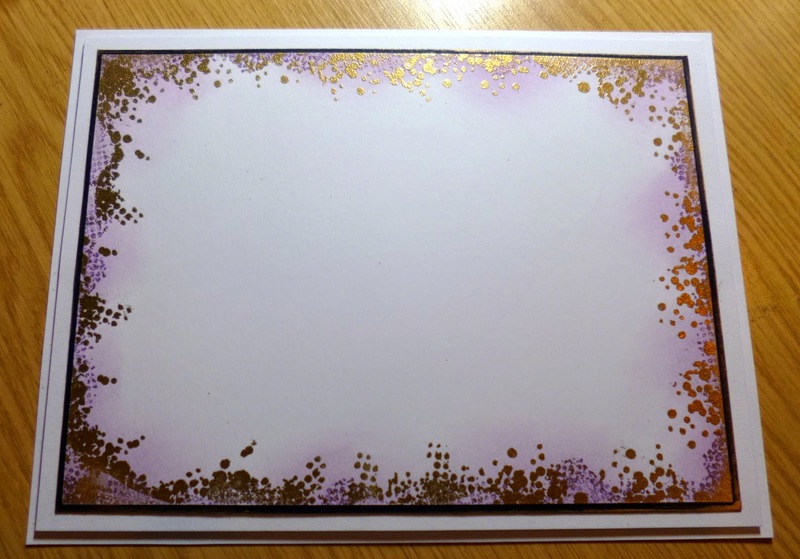 Remember to add you Visible Image makes to the ‘Show and Tell’ challenge – details HERE. 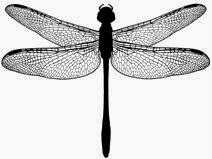 Visit and like the Visible Image Facebook Page HERE. Wow! 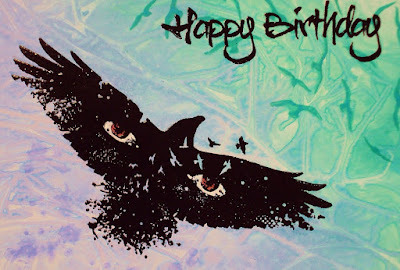 We love this card! The white feathers look fabulous against the colourful background. 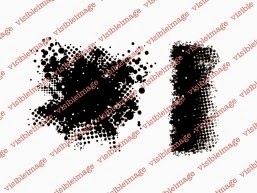 Check out those eyes in the mask stamp <3 And isn’t that fingerprint stamp from the ‘Drag and Drip’ set great! 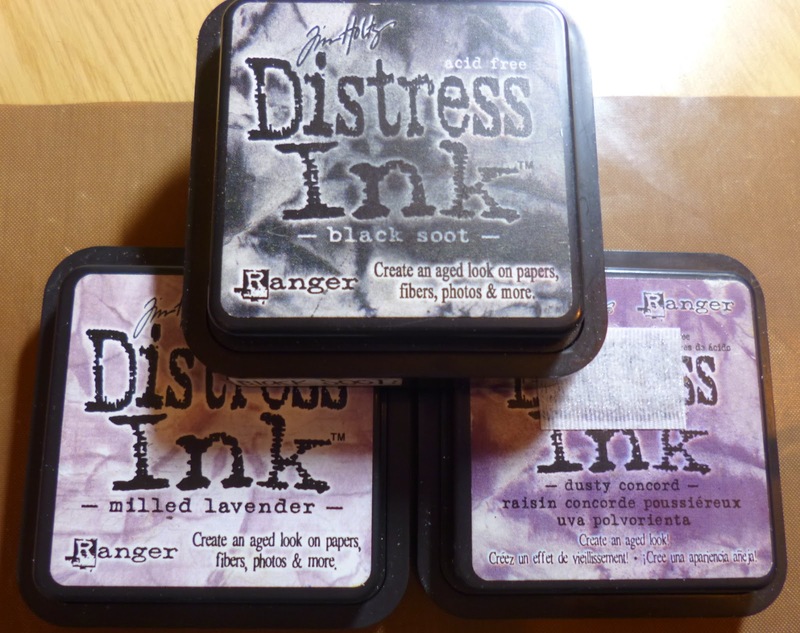 Have you got your hands on any of our awesome NEW stamps yet??? Unique designs. 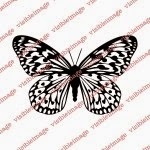 Superb quality clear stamps you will adore stamping with! Thanks for visiting and pop back soon 🙂 Our DT are here every day with new creations to inspire you! 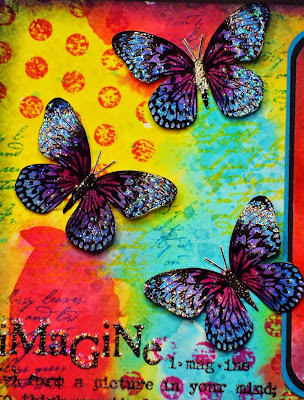 Here’s my weekly inspiration, using some of the fantastic Visible Image stamps available. 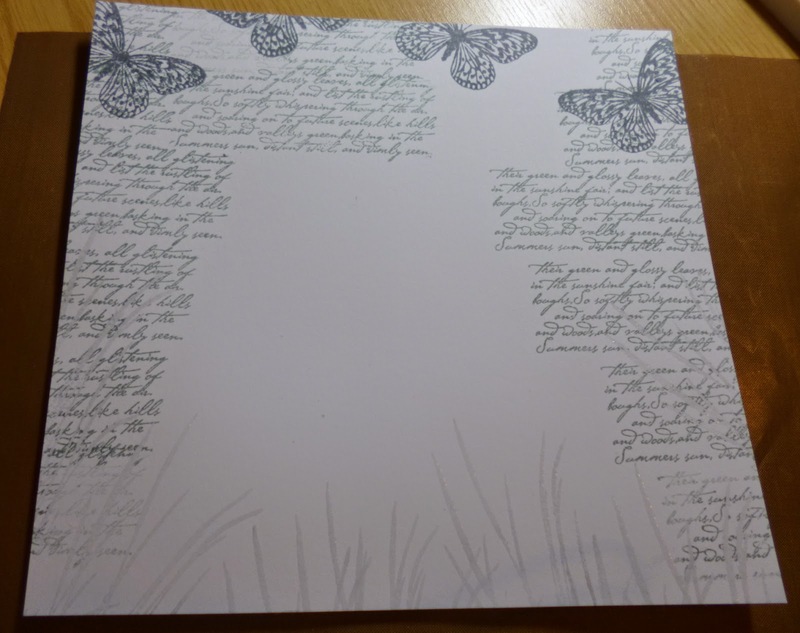 Woman Inkognito, Butterfly, Imagine Dream Inspire, Grunge Polka Dot and Bronte Script. I’m sorry, but the photo’s are not the best, the day’s have been so dark, that I’ve had to rely on a daylight bulb, lol !!!! I started off making the background, mixing Brusho’s separately with a drop of water in a palette, 3 colours, yellow, turquoise and red. 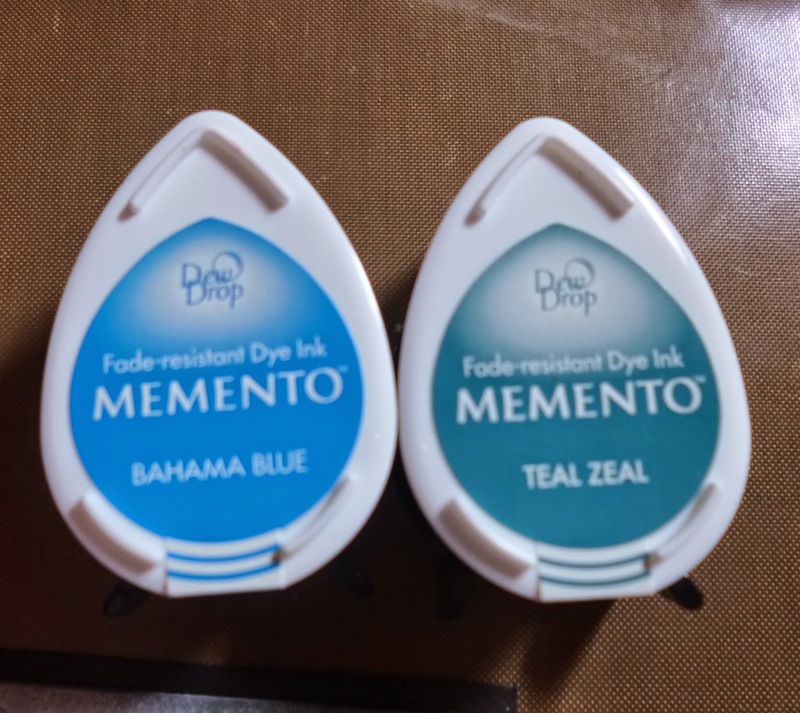 I painted them randomly, letting them merge if they wanted to. 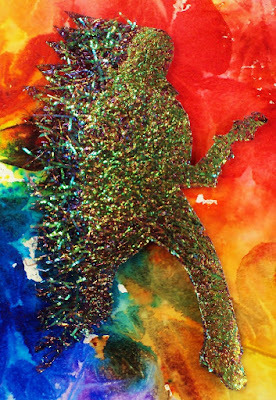 when that was dry, using a paintbrush, I flicked the left over paint all over it. 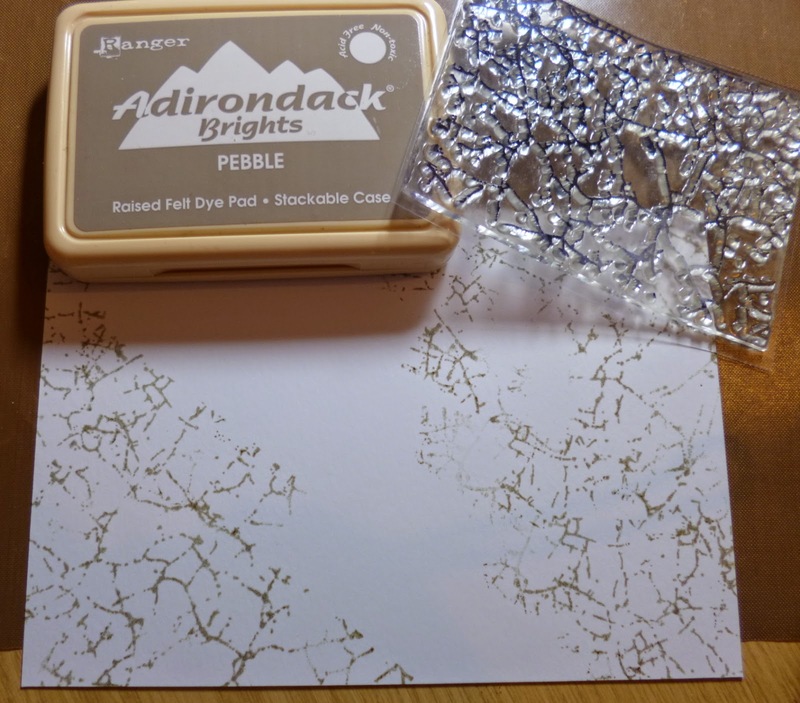 I then stamped the dots, just holding it in my hand, again randomly, using Picked Raspberry distress ink. 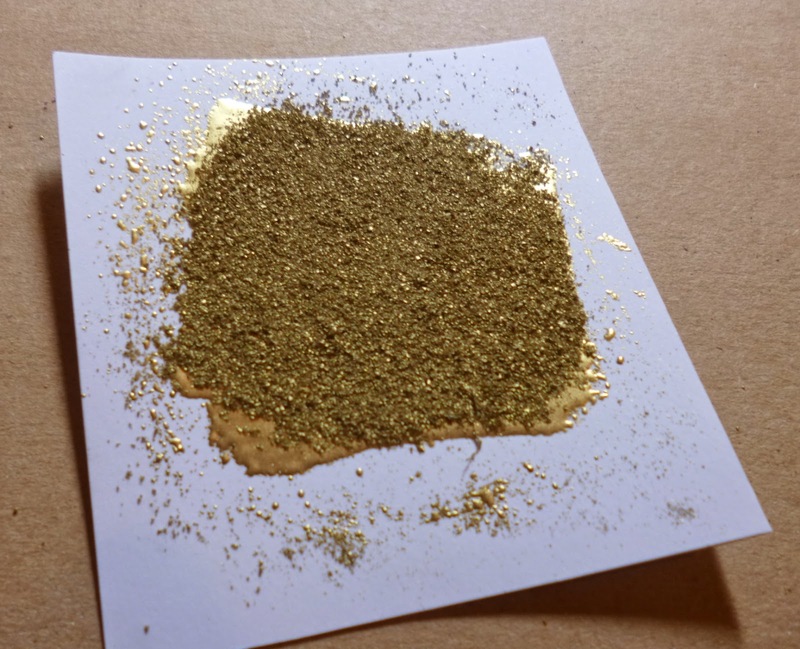 I used the same method with the script stamp, but used Peacock Feathers, and then again with Mustard Seed. 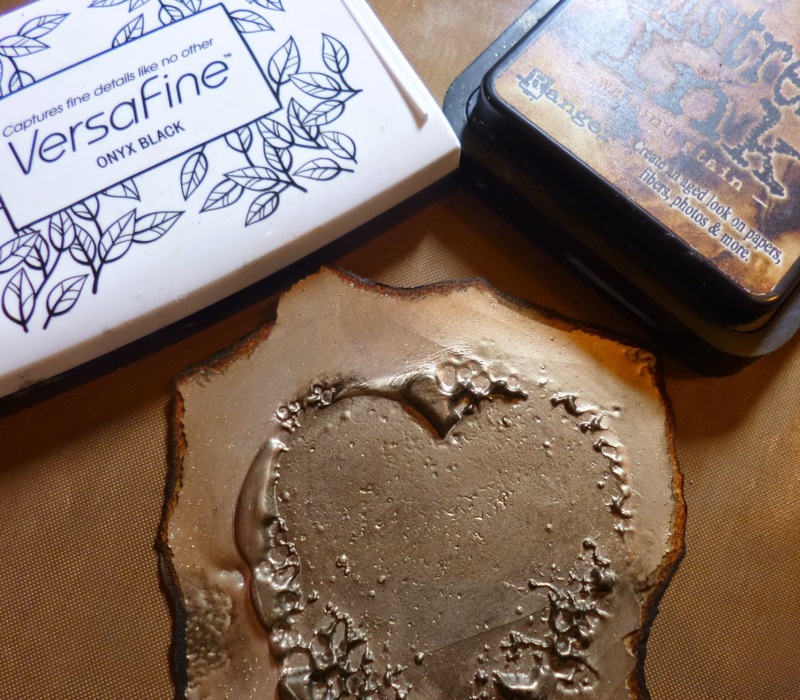 I stamped the sentiment with Versamark, and heat embossed in black. 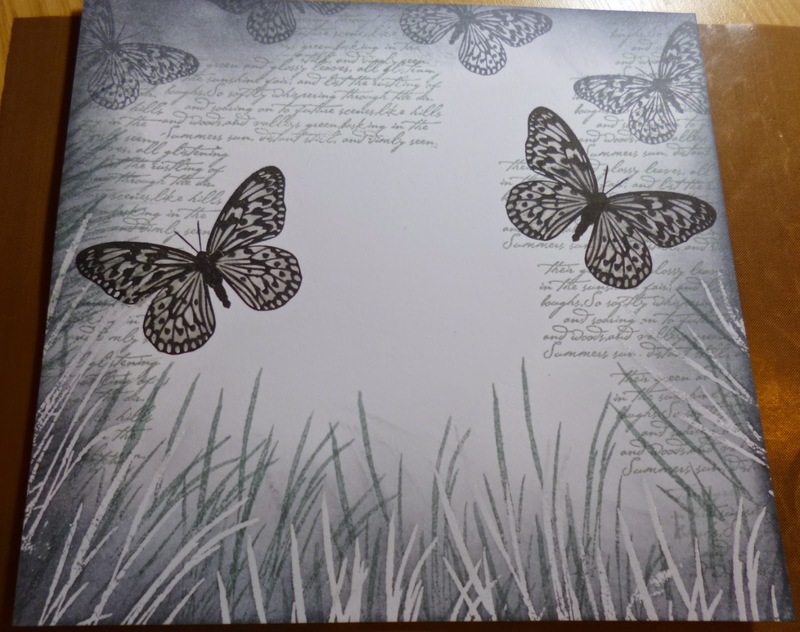 I stamped the butterflies onto white card with Versamark and heat embossed again using black powder, coloured them with distress inks, fussy cut, shaped them and added Stickles. 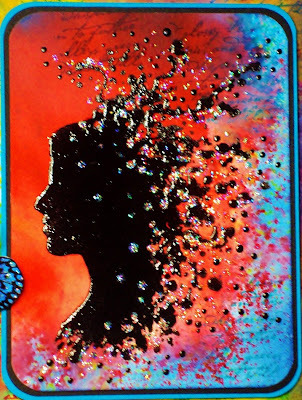 For the Woman, I sprinkled a small amount of red Brusho onto the card, and spritzed with water, running it to the left, don’t worry if you have white card showing, this adds to the splattered look, and can be coloured with Salty Ocean Distress ink. 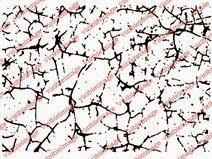 Totally dry it, then add a swipe with an anti-static bag, and stamp the Woman with Versamark, and heat emboss in black. I then added a coat of glossy Accents to all the black, to give extra dimension, when it was dry I added Stickles to bling it !!!!! 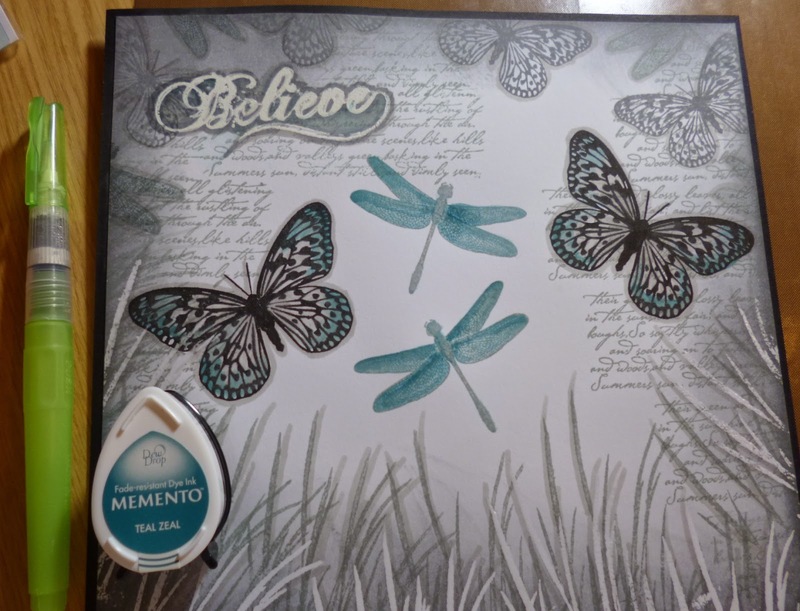 As you can see I rounded the corners, and mounted it onto black and blue card stock, before adding to the card with glue gel, then added the shaped butterflies with glue gel too. 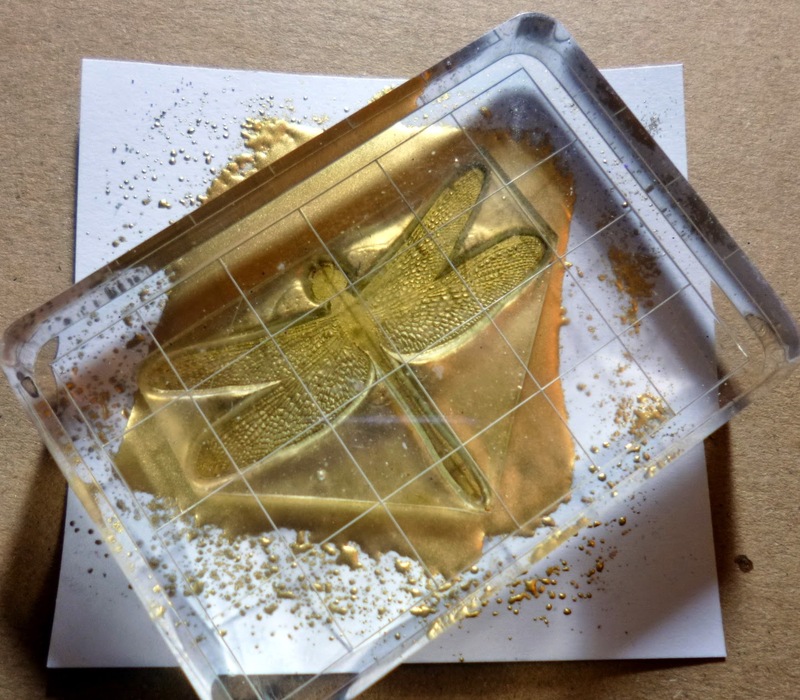 There’s a couple more weeks for you to enter the November Visible Image Challenge, the theme being ‘Your Favourite Visible Image Stamps’, a very easy one for your chance of winning a £20 coupon to use on the website. All details HERE. If you haven’t got a blog, you can still enter in our Facebook Group HERE. Thank you for visiting today, we’ll be back tomorrow with something awesome from Amber! 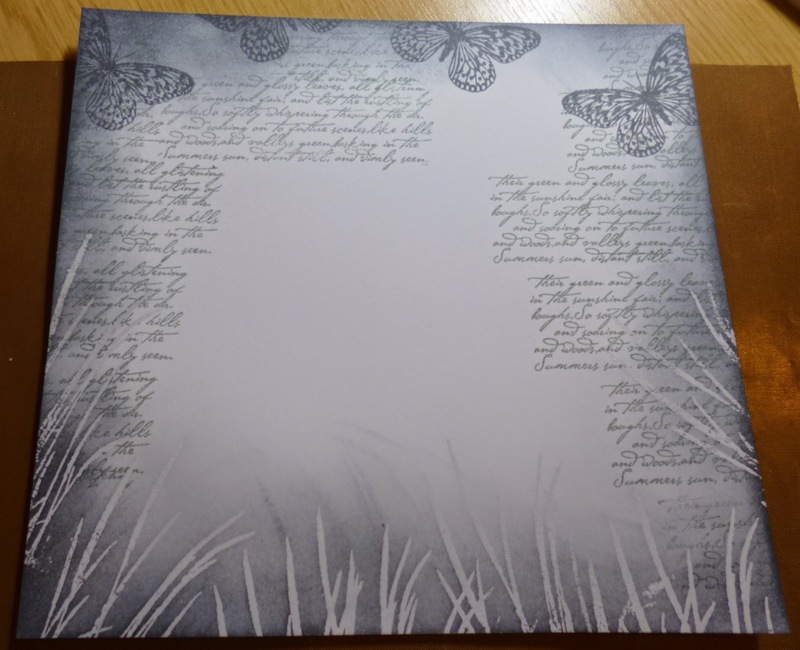 Today’s post is all about our stunning Butterfly INKognito stamp. it’s been a sell out at the shows and is flying out of our shop! Show us what you have created by uploading your photos in our Facebook Group! 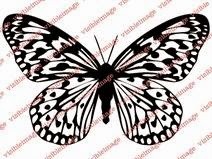 If you haven’t got your hands on this amazing stamp yet, it can flutter into your basket right HERE! Hello and thank you for coming to visit today! 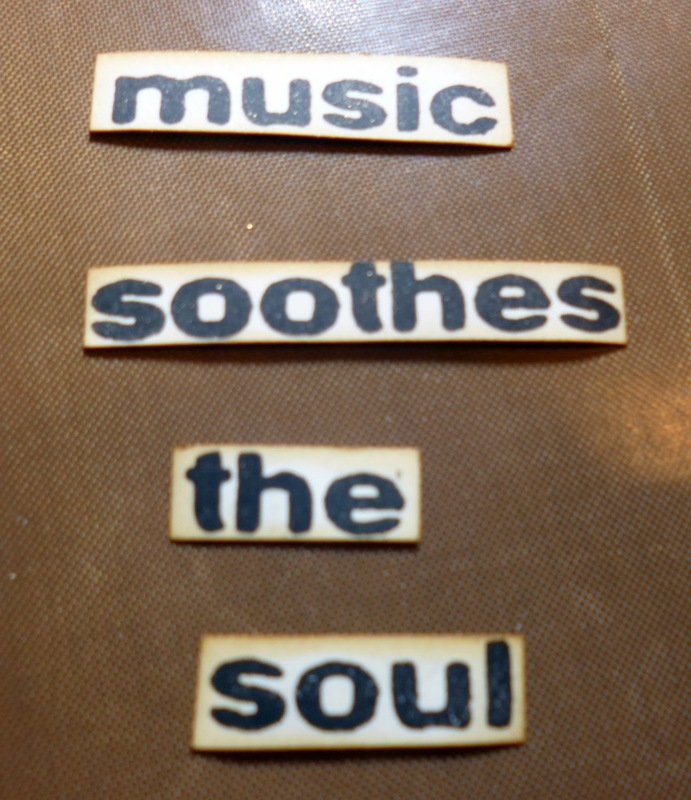 the sentiment from Max Rocks, and some great masking! 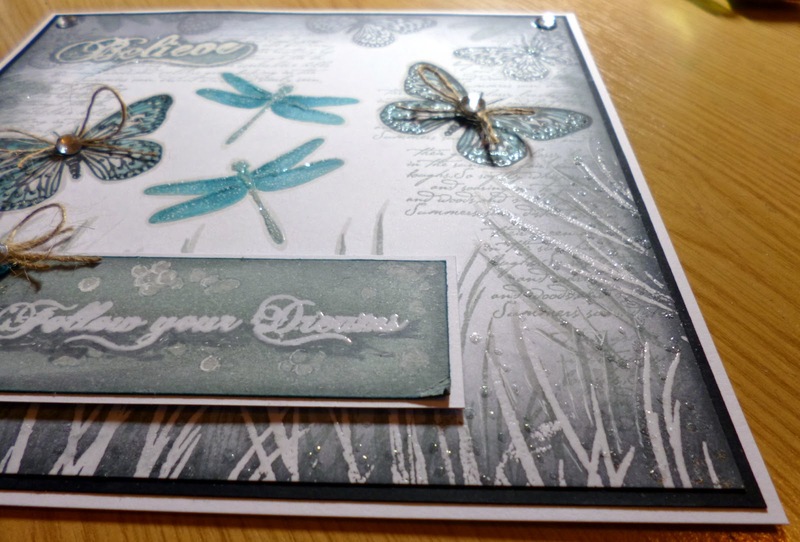 Imagine Dream Inspire set, and using our Tall Grass stamp for the fringe! Hi, thanks for coming to visit today! 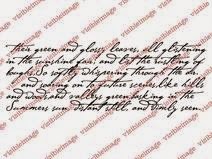 I love this effect I think it is very manly and they are definitely colours easily carried off for a guy. 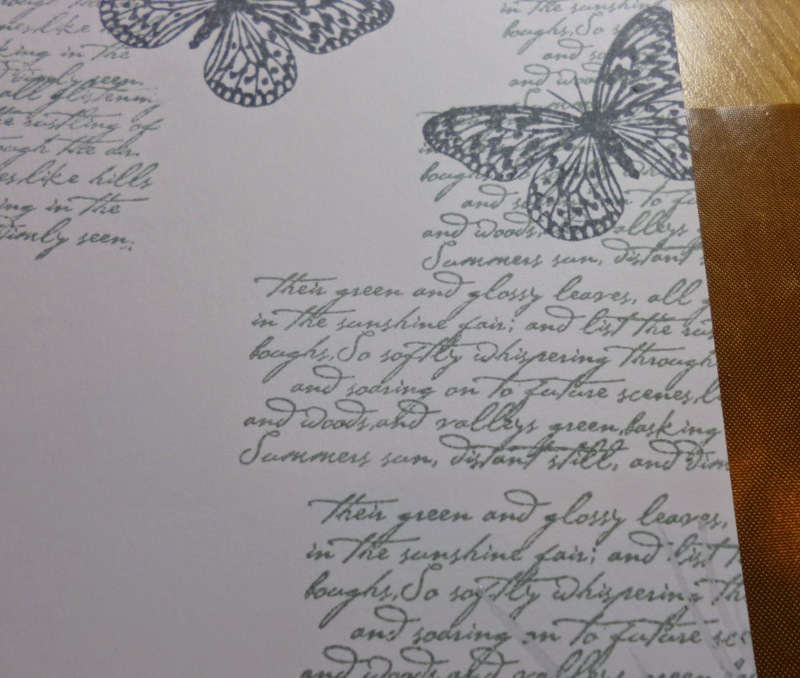 So I took a piece of white card , not too thick so we can crumple it and make it have some creases later on .I stamped the writing from the Revolution set and wow the pattern repeats so easily, and you cannot even tell where it starts and stops. Brilliant! 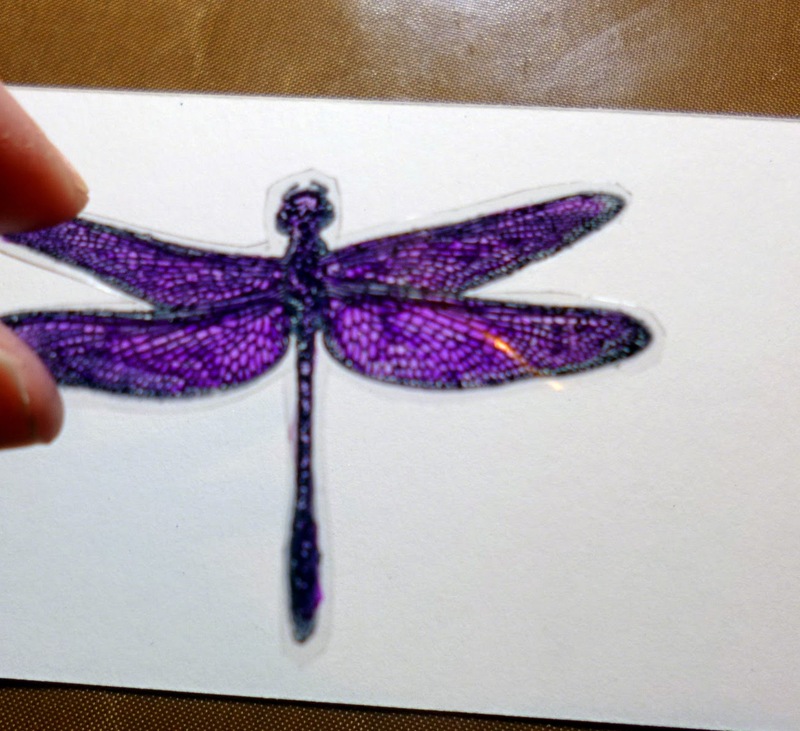 I used a black archival ink and blasted it dry for a few seconds with my heat tool. I then choose Peacock feathers, Vintage Photo and Walnut stain distress inks and coloured in my usual way ( you all know it now don’t you). First coat goes on very patchy and you can see the lines etc, ignore it and do another coat it will all come together, these colours all blend well into each other so over lap them this time and get rid of any white of the card this time. Run some Walnut stain around all the edges including the Peacock feather colour do darken and pull the eye into the main focus. 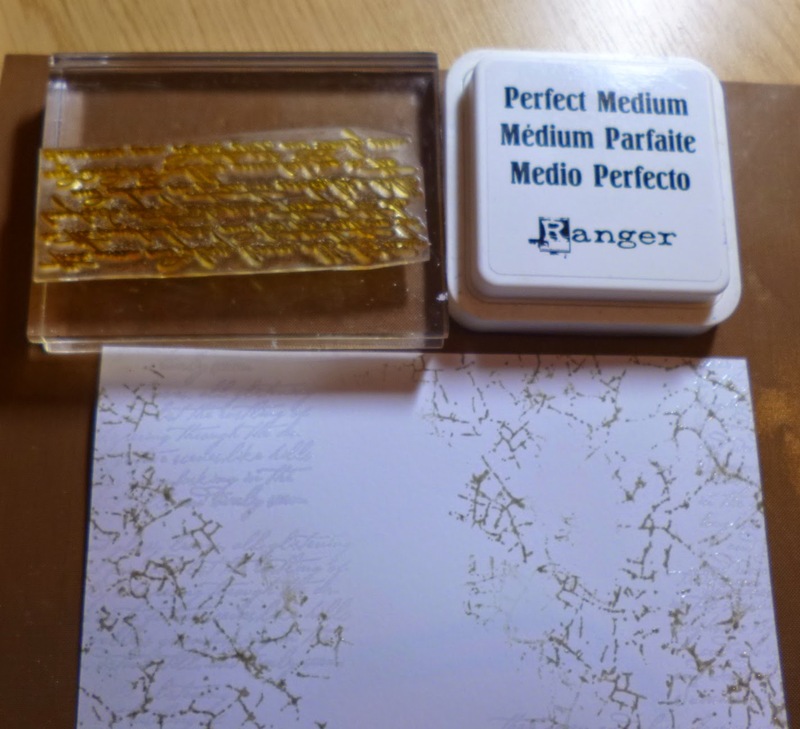 I crumpled the card up but not screwed it up, just made some obvious grooves and dips, a few creases too so I can get some Gilding waxes onto it a bit later. 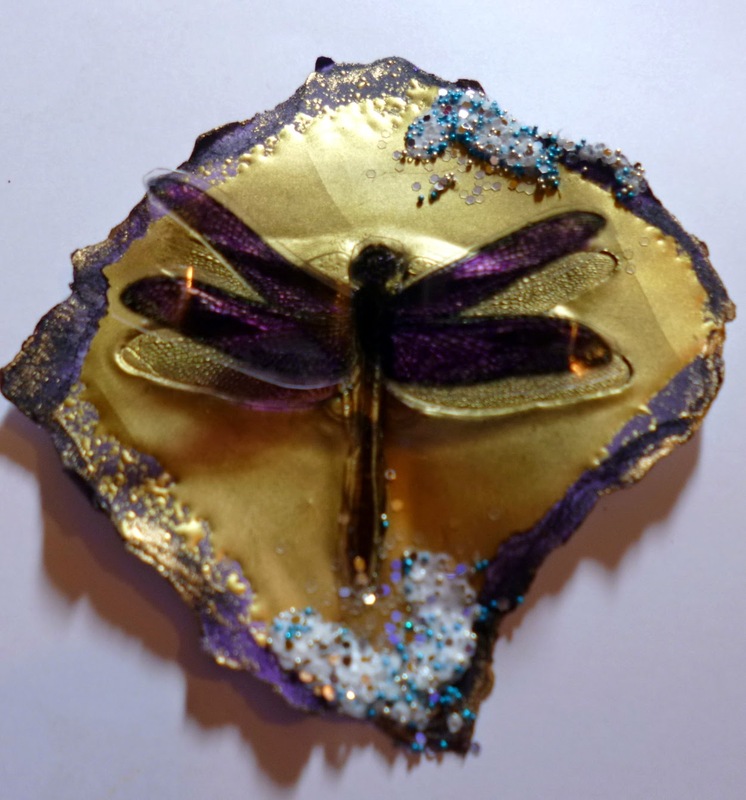 I added the entire piece onto a piece of brown crinkled paper , It is very thin so you have to be careful not to tear it but it suits a male card I think. I then cut myself a strip of Hessian ( ahh my lovely hessian, I missed you). 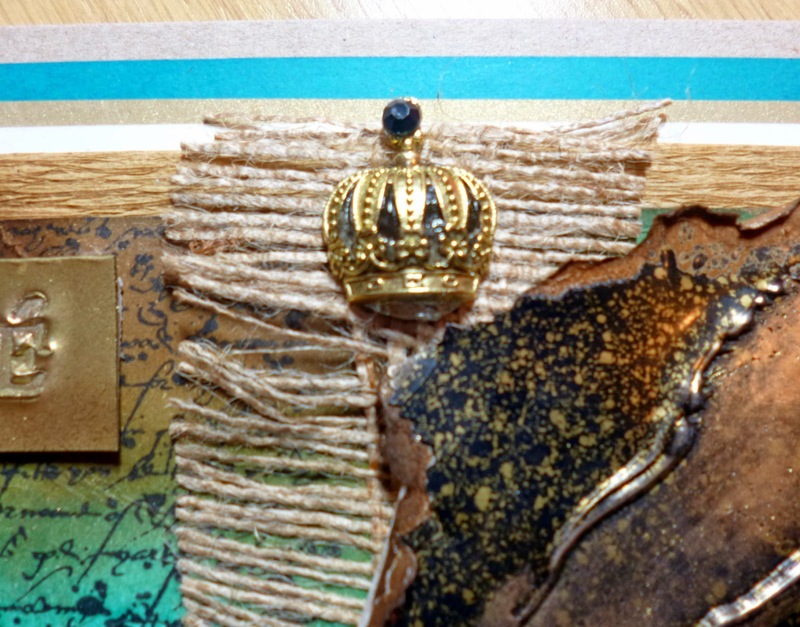 I frayed all the edges and stuck it down on the back of the crinkle paper I also added a dollop (techy term lol) of glue to the front of the card under the hessian just so it didn’t lift up or move etc. 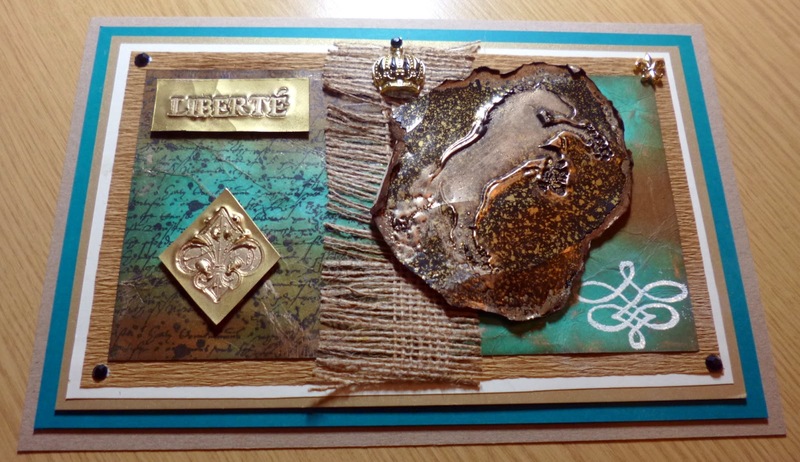 I then matted that entire piece onto cream then a piece of soft gold card which i raised up onto foam and added that to a turquoise layer and lastly a thick Kraft layer for the back. So this was our base completed. Now the FUN…. 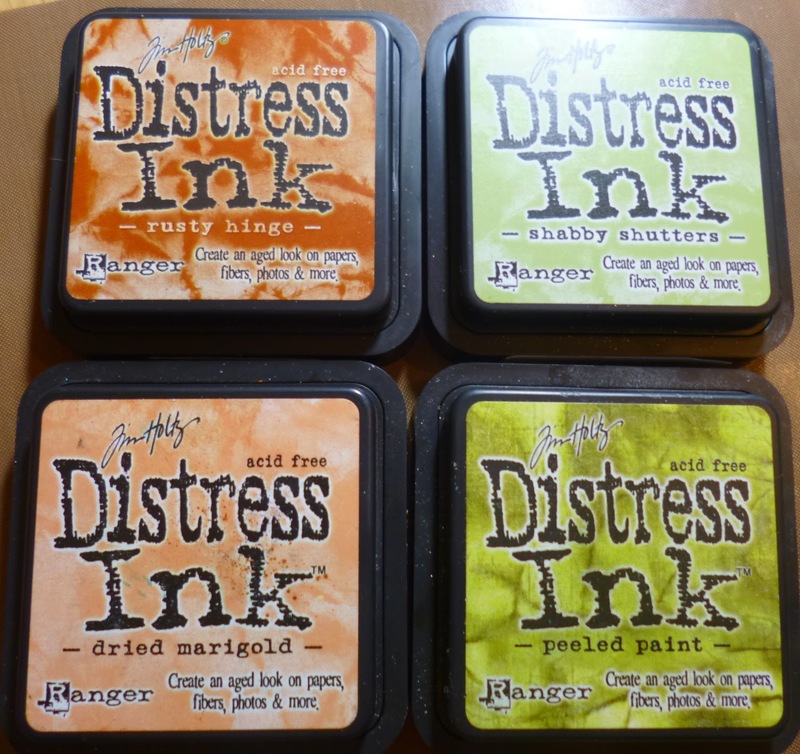 I took a mixture of UTEE and normal embossing powder and opened them ready on the table, I took my stamps (yes my clear, deeply etched wonderful Visible Image stamps )and I coated them in versamark which will help the release. 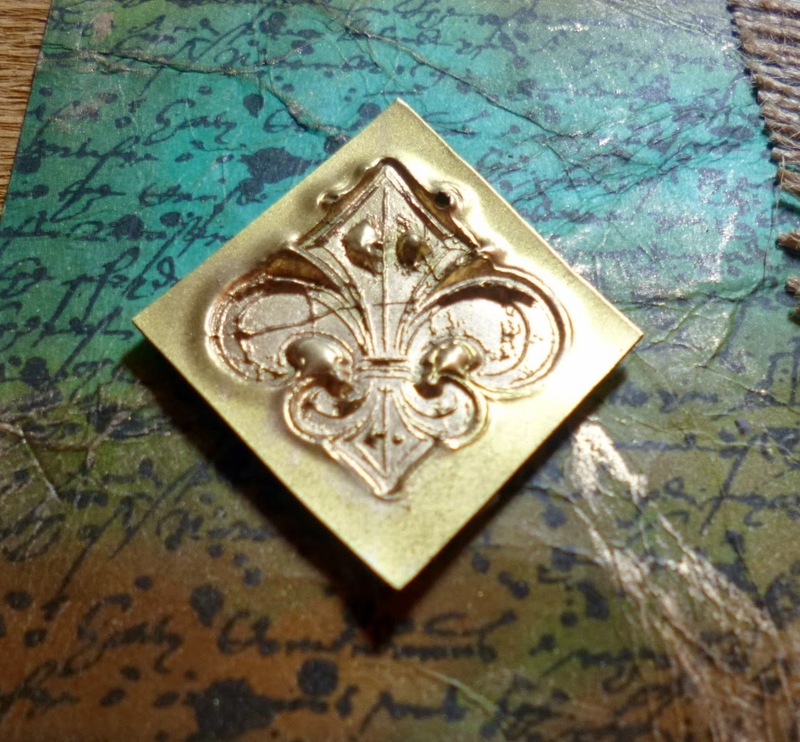 The fleur de lis is done with 2 layers of normal gold detail embossing powder and 2 layers of utee, reason being , I am going to push the stamp into the Utee and through the layers down into the detail powder melted under those top coats so I will pick up all the wonderful marks and distress shapes in the designs still where you can sometimes miss some with Utee. 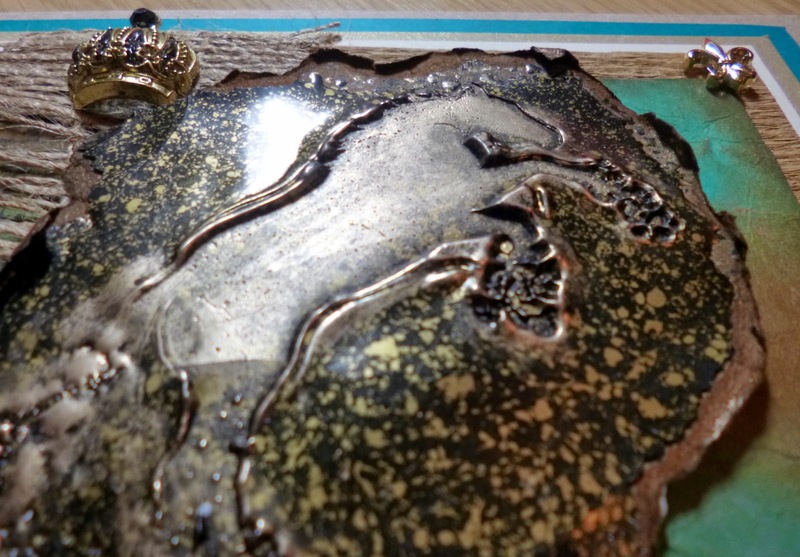 Then I wanted to use the full horse Image in the same way but I wanted the colours to mingle and run and mottle , This had the same amount of layers but slightly thicker each time, while the powder was still molten move quickly and again push your stamp covered in versamark straight into the liquid metal. 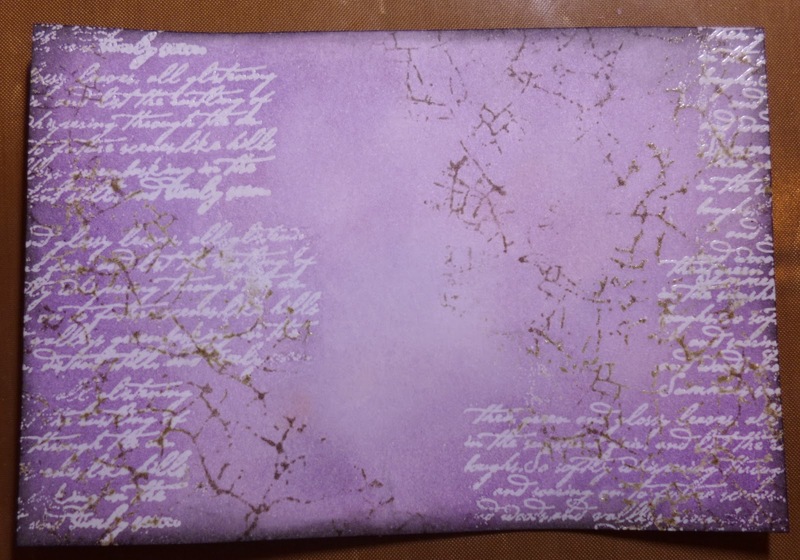 Again let it cool slightly and peel out the stamp, I was really happy with the cleanness under the image and again I used my gilding wax to cover the inside parts of the stamped area and buffed to a shine with a soft cloth. 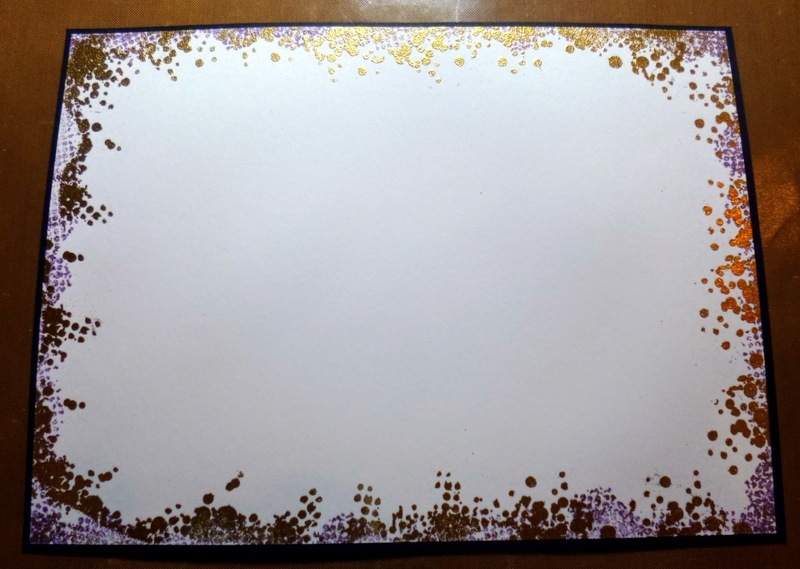 I tore the edges and inked them with the two browns again and again used a little gilding wax on the edges to finish and pull everything together. 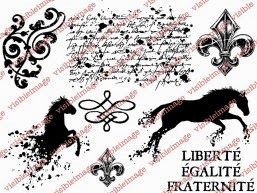 I decided I wanted the liberte word the same way so I went ahead the same way and did that and added it top left, I also decided i wanted a flourish In Ivory in the bottom right to balance the card and I just had enough room if I didn’t use a block yayy. Well I love doing all these technique type things, it so good to get in there an play and see what comes of it isn’t it. 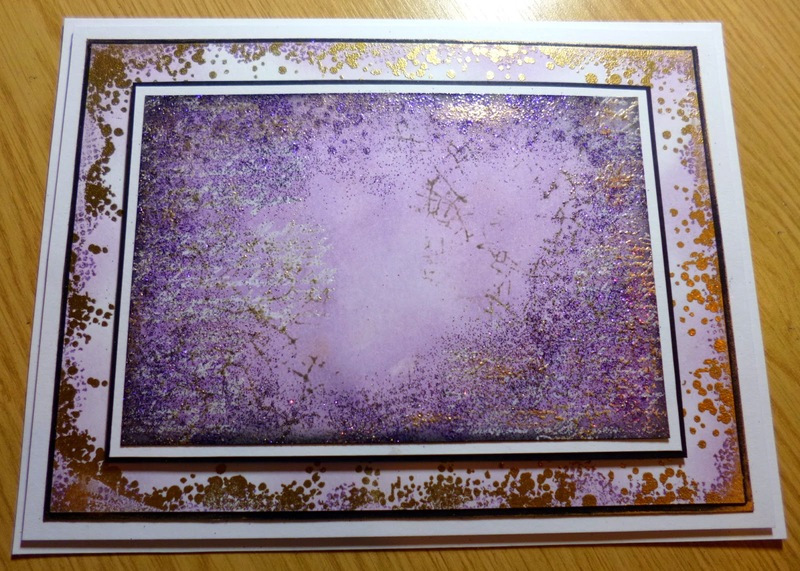 Here again is the fabulous set I used to create the above card. 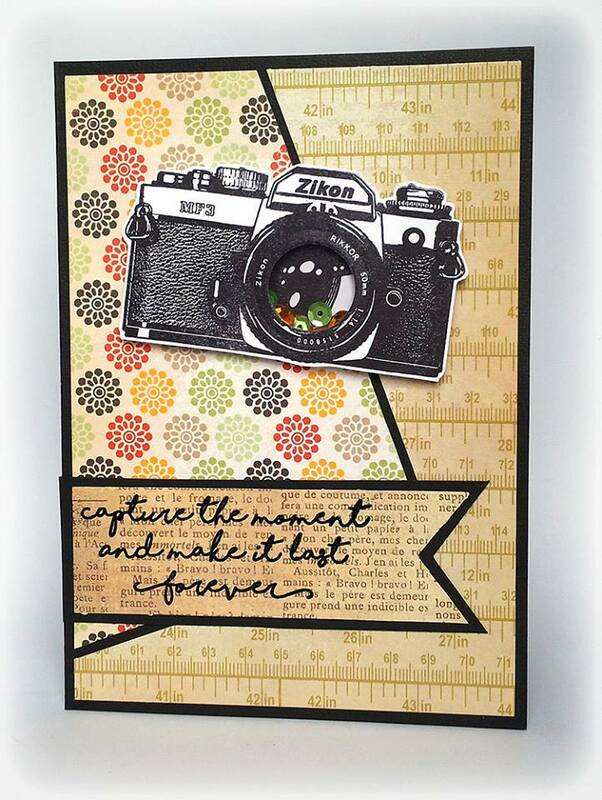 Visible Image stamps …perfect stamping ! Hello! Thank you for coming to visit us. So which stamps are on your wish list?! to find out the March challenge winners!